This is Greg Montie's concept of a high rolling efficiency track. The idea is to have a single V-belt for low weight, and a high efficiency linear (smooth) roll motion. A chain of aluminium cleats are riveted to the V-belt to complete the track. The cleats wings are curved to the diameter of the pulley wheel. This makes for a smooth rolling surface for the pulleys to travel on. The cleats are made from 0.032" (or 1/32") aluminium. 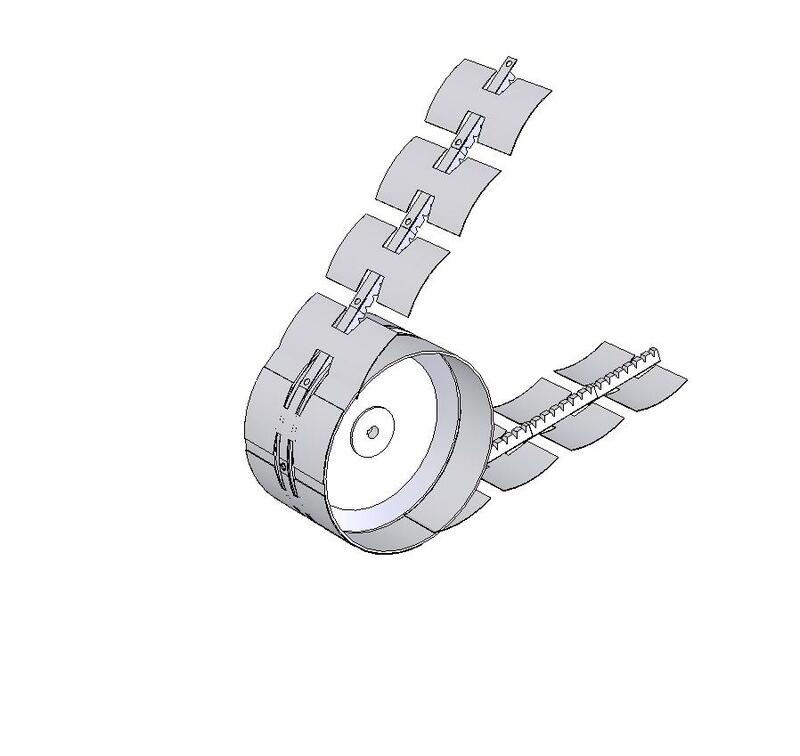 This aids in weight reduction and allows for each cleat's connector tabs to flex while following the V-belt around the pulley wheel. The cleat wings are not very strong as they are cantilevered on either side of the V-belt. However, the strength is improved by the general curved shape of the cleat. Furthermore, each cleat wing is protected during its most loaded duration - directly under the pulley wheel that carries the majority of the vehicle weight. This is accomplished by welding drums on either side of the pulley wheel, of equal diameter, that directly support the cleat wings under load.